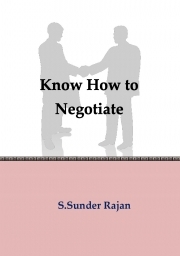 Description of "Know How to Negotiate"
The book is a result of the authors experience in over 20 years of negotiating in various situations and is replete with case studies based on personal experiences. The material in the book has been tested during MBA courses taken for working professionals who have had the chance to try out these concepts in their workplaces. The book hopes to dispel the myth that "good Negotiators are born not made" and shows how anyone can develop the skills to become a good negotiator, a skill rated as being indispensable for a future leader. 1. The first four chapters introduce the concepts of Negotiation, the terminology and strategies, akin to showing the lay of the land for the imminent journey. 4. The final two chapters get down to a process detail level – identifying the tools a negotiator needs, processes with steps they can follow with helpful templates, checklists that allow them to make this negotiation journey repeatedly and successfully. The author, S.Sunder Rajan (Sunder), has over 20 years of experience in the IT and Financial services industry having served as a Senior Executive (CEO, CIO) in ANZ, Lehman Brothers in India and overseas. His experience includes setting up and running large organizations (over 1000+), execution of large financial services applications, development of financial services products. His interest areas span Technology, Finance and Management including Data Analytics, Risk Management, Banking (specifically Investment banking), Technology solutions for SMEs and Senior Management Development / Coaching. He is currently a Business Director at Promantia Consulting LLP (www.promantia.com),an IT and Education services company. He is on the advisory board of Wealth Managers United Ltd (www.wmuindia.com) a boutique investment management firm. Sunder is a graduate from IIT Kharagapur (B.Tech) and IIT, Madras (M.Tech), with an M.Sc.E from the University of New Brunswick, Canada and has attended the CEO development program at Kellog School of Management. Sunder is a Visiting Professor of IT & Finance at NMIMS, Bangalore taking courses for Executive MBAs. Apart from this he also conducts professional programs for Silverbrook Learning Center (a Mumbai\New York) based company. Reviews of "Know How to Negotiate"